It is my pleasure to invite you to join us for the 23rd Annual Art Auction of the Shield of Athena Family Services. This event will take place on Sunday, November 12, 2017 at Le 1000 (1000 de la Gauchetière West) and our goal is to raise $100 000. At this year’s event we will honor Avon Canada, who came to our rescue with a brand new van when ours was stolen. Without this vehicle we could not pick up essential donations such as food, baby items, and transport clients to appointments and activities. We are working endlessly to eradicate family violence , protecting many women whose lives are in danger, empowering them to rebuild a healthier home life and helping their children break the cycle of abuse. We do need your help to open our 2nd Step Resource, that will provide long term housing and safety that our clients and their children need. Over 20 000 women are admitted in emergency shelters annually. However, only 11 Second Step resources exist with 100 spaces. Your support of our project is therefore crucial for its success! 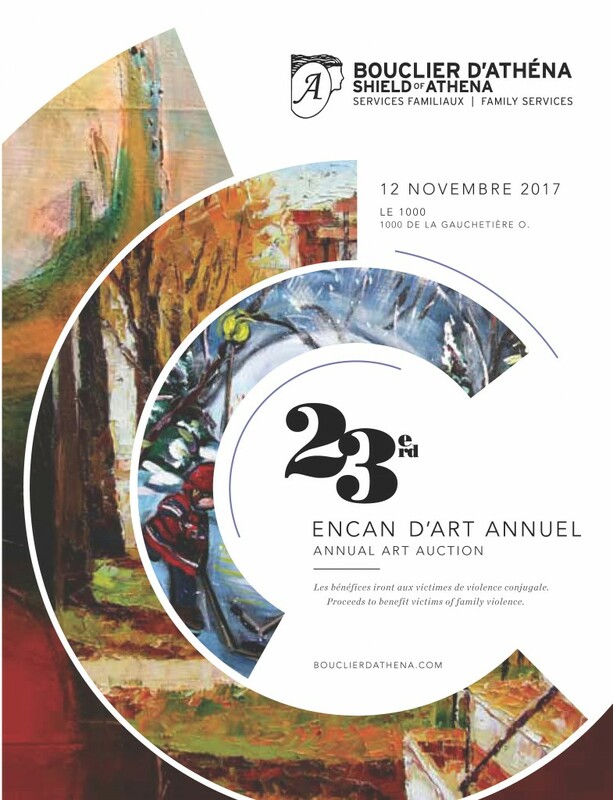 We ask for your support of this year’s Art Auction. You can do this either by becoming a sponsor or by placing an ad in the Art Auction program book. In addition to the visibility that your business, commerce or association will receive, you will also be raising awareness on an issue that matters to so many. The Shield of Athena is a non-profit community organization that depends on fundraising events in order to provide many of its much-needed services. Our 2nd Step resource will materialize only with your combined community and business support! I thank you in advance for your generosity. Please, follow the link for the form. Stelios Antypas, Bedros Aslanian, Suzanne Bélair, Alfred Blanchard, Régis Boivin, Thomas De Souza, Johan De Vos, Jan Delikat, Arianna Garcia-Fialdini, Marina Gavanski Zissis, John E. Gouzopoulos, Yoanna Kissel, Georgia Kourleti, Avy Loftus, Lyne Marquis, Katerina Mertikas, Natalia Midvichi, Vladimir Midvichi, Janusz Migacz, Jacqueline Marie Milner, Stéphane Parnel, Joanna Pienkowski, Georgia Priniotakis (Kalas), Pouneh Saber Sheikh, Emmanuel Sifakis, Paul Soulikias R.C.A. Karolina Stachowicz, George Tsoukas, John Vazalinskas, Pei Yang, Marek Zoltak, Marine Zuloyan. Tickets are available at $ 75 each. 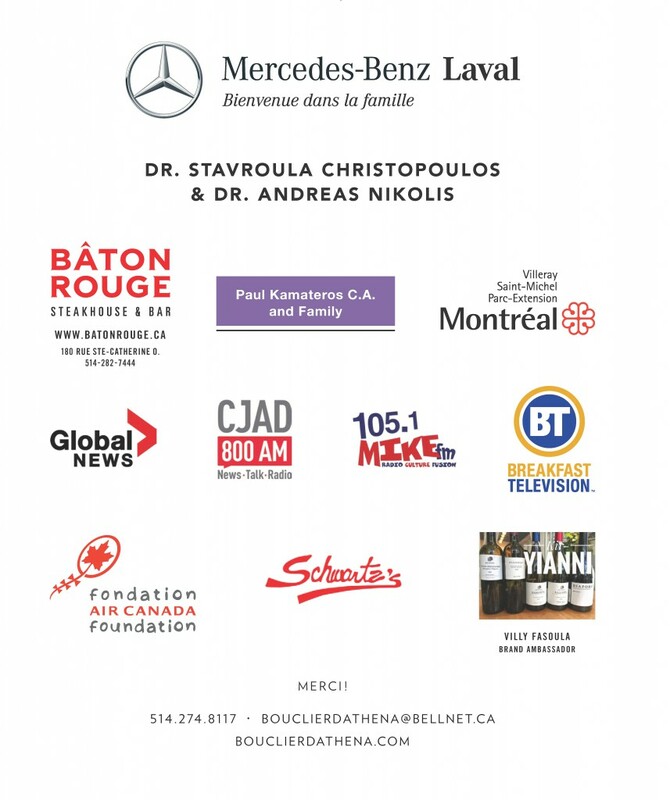 You can purchase your tickets by calling 514-274-8117 (Visa and Mastercard are accepted). To purchase online please click on the following link: BOUCLIER D'ATHENA. COM (All online purchases will cost you an additional 5$ per ticket). Tickets will also be available at the door on the day of the event.